I've been eyeing the south central Illinois area for the "prime spot" for Wednesday's storms. Tonight's 0z computer model data keeps my interest peeked for that area for early Wednesday afternoon through early evening. 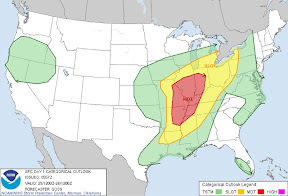 The Storm Prediction Center keeps all of the KFVS viewing area (southeast Missouri, southern Illinois, western Kentucky, northwest Tennessee and northeast Arkansas) in a "Moderate Risk" of severe weather Wednesday. The SPC forecasters have shifted the moderate risk area slightly north and northeast from Tuesday's forecasts. I am still holding pretty steady with what I mentioned in my previous post. All modes of severe weather (hail, wind an tornadoes) will be possible. I still think the general time frame of the "main event" will be from 1pm until 7pm or 8pm. I need some sleep. It's likely to be a busy day tomorrow.